Even though you will have no choice but to have Eevee as your Starter Pokemon in Pokemon: Let's Go, Eevee, it will immediately become your Partner during your journey throughout the Kanto Region. As your Partner Pokemon, Eevee will always be with your trainer. It will never be carried within a PokeBall, but rather will travel with you by sitting on top of your trainer's cap. 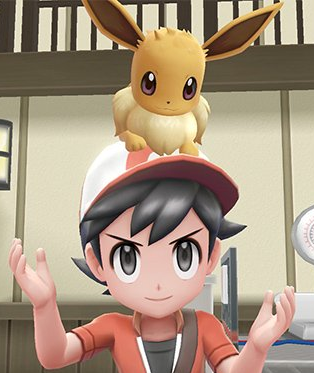 Even if your trainer is riding on another Pokemon, Eevee will remain positioned on their head! In addition to this, Eevee will even jump off of your trainers cap when sent into battle!